Mount Baldy is one of the toughest day hikes I’ve ever done. 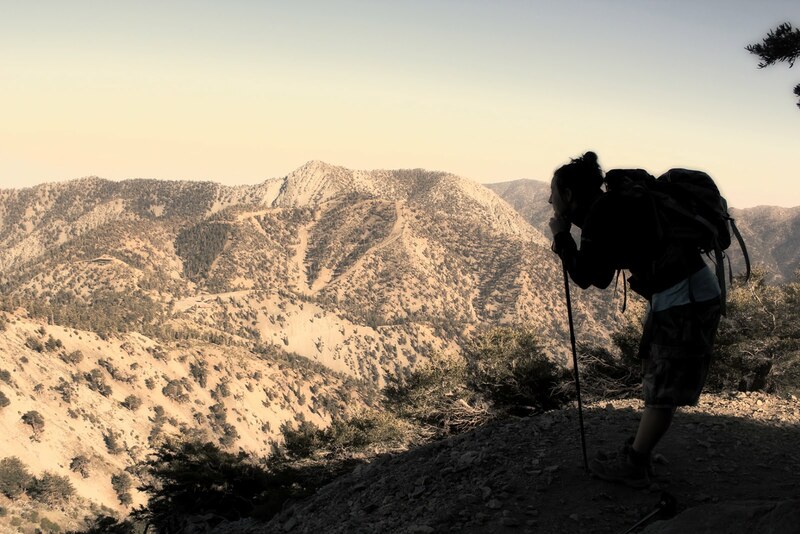 If you're out of shape, reaching the summit may prove to be more than you can handle. You can opt to skip the worst part of the trail and get a lift ticket to ride the Baldy ski lift to the middle of the mountain. This will shave about 2,000 feet of elevation gain off your hike. Otherwise, the hike will start at Falls Road. Falls Road is the main service road for the ski resort. It would be a great trail if the pickup trucks didn’t drive up and down it all day kicking up dust in your face. A ton of people drive all the way up to Mount Baldy just to hike the first mile of Falls Road to see San Antonio Falls, a 150 foot waterfall that cascades down the face of the mountain. If you choose, you can hike down an easy ¼ mile side trail and take an icy swim at the base of the falls. The falls are directly exposed to the sun for most of the day, so it’s a great place to lay out and work on your tan. After passing San Antonio Falls, you can either continue on Falls Road or take a partially hidden left hand spur for the shorter, although much steeper ‘ski hut trail’. Most people opt to turn the hike into a loop and hike up Falls Road and come down the ski hut trail. I decided to take the ski hut trail up the mountain. It was a mistake that my legs won't soon forget. The ‘ski hut trail’ is completely exposed to the sun and murderously steep. It gains nearly 3,000 feet in elevation in about 2 miles. I saw a lot of unhappy faces this weekend trudging up that mountain. I watched a dad berate his two teary-eyed sons and the family dog because they refused to hike any further. The little bloodhound collapsed on his front paws and just stared up at that moron yelling in his face. I almost said something to the dad, but he had a terrible tribal tattoo and a protruding forehead like those caveman in the Geico commercials. He didn't look like a man who was capable of engaging in a rational discussion. They weren't even half way up the trail. I also saw a lot of people hiking with inadequate water, my girlfriend included. I ended up sharing half of my water with her. On a sunny day, I would expect that 2 liters per person would be a reasonable amount of water to bring. You can sometimes refill your water bottles at the Sierra club shack or the ski resort, but I wouldn't want to rely on them because they aren't always open. Now that we’ve covered the bad, let’s talk about the good. 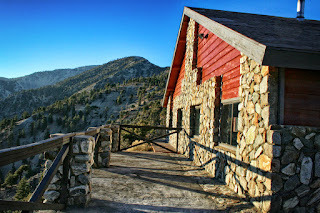 The peak of Mount Baldy is one of the most beautiful spots in all of Southern California. You get a 360 degree panoramic view of desert, mountains, forests and cities. The gnarled hardwood trees at the peak are iconic symbols of the California high country. The Devil’s Backbone Trail, which runs for several miles on the ridge of the mountain, is probably my favorite trail in Southern California. In some spots, the trail is only a few feet wide and drops for several thousand feet straight down. I imagine that some people take one look at that trail, turn around, and head back down the mountain in the other direction. If you're brave, you will be rewarded with uninterrupted views of the diverse landscapes below you. 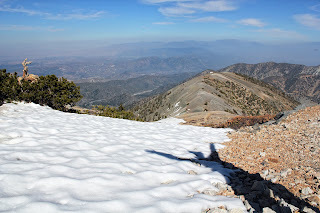 Baldy Ski resort is another highlight of the hike. 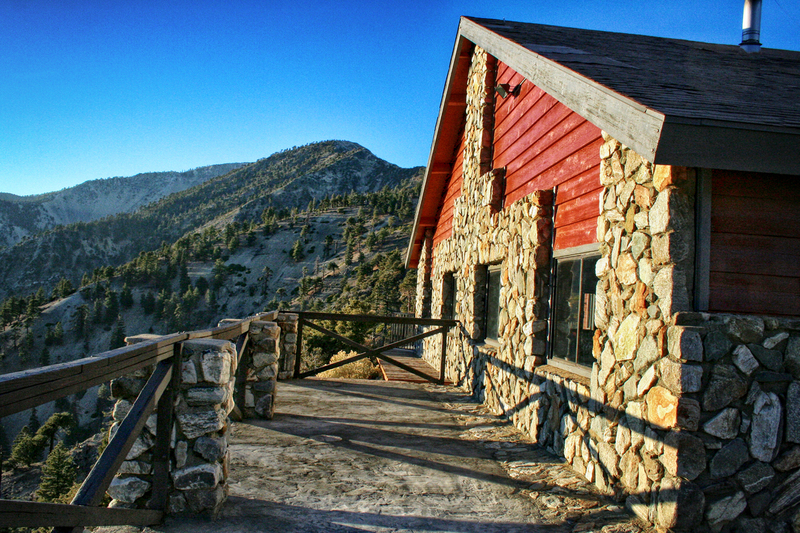 The lodge, bathrooms, restaurant and bar are open on weekends during the summer. They have a small, but surprisingly good draft beer selection in the bar. I would have expected Bud light and chicken fingers, but they had Stella Artois and bratwurst! There is nothing more satisfying than conquering a mountain and then drinking a beer to celebrate. The views from the ski lodge are amazing. It would be a memorable place to take a date. I didn’t feel guilty at all about purchasing a 10$ lift ticket, tactfully avoiding the final dusty 3 mile stretch of Falls Road. The ski lift was a relaxing finish to a daunting 5 hour hike. Directions: From the 210 in Claremont, exit on Monte Vista Avenue and head north. In one mile, Monte Vista changes to Padua. Follow padua for about a mile and make a right onto Mt Baldy Road. Follow Mt Baldy Road North for approximately 13 miles until you hit the parking lot for Mount Baldy Ski Resort. Or, you can just set your GPS for Mount Baldy California. There is also plenty of free parking.